Julia Friedman had Shake Shack at 11 p.m. last night and since has been dedicated to clean eating. 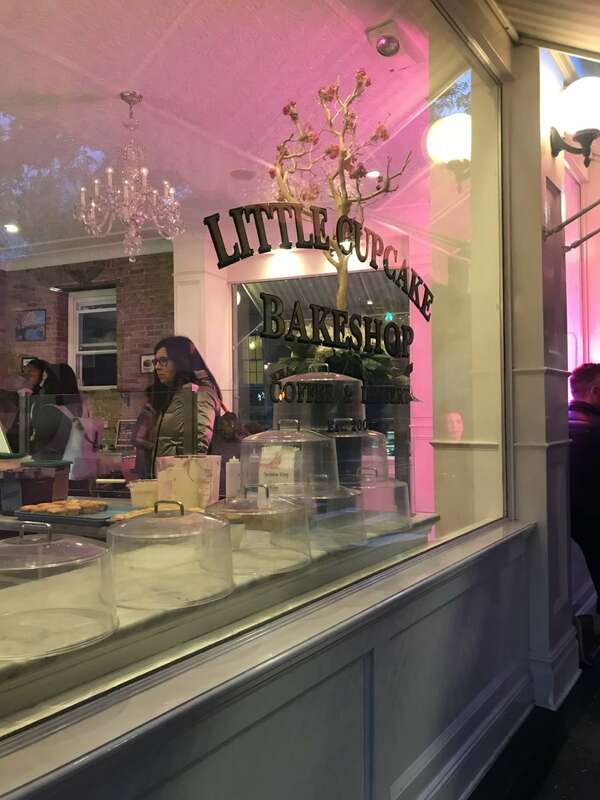 Luckily, we meet at Little Cupcake Bakeshop on Prince Street, a dangerous few blocks from her downtown apartment. “Like your body just doesn’t know how to react,” she says through a shy giggle. She says the rest without really saying much at all. Her short breaths and wide eyes tell me all I need to know about the Brooklyn Blackout Cake. And as we sit a mere forks-length from the display counter, dressed in Black and White slices and pyramid-stacked S’mores Bars (add ‘em to Julia’s list of favorites), I’m given an Instagram-verified, Steve Madden-endorsed, sweet-toothed lowdown of NYC’s most divine dessert spots. You’ve all seen the pictures – break open their s’mores cookie and it nearly puts Levain to shame. With a menu that ranges from cream cheese-frosting-laced, white-chocolate-chunked, red velvet cookies, to mason jars packed with molten cookie doughs, ganaches, and craters of buttery, toasted marshmallows… I just started a shipping order. Whoops. Just take Julia’s word for it – not hesitant to hem in some honesty – “the Birthday Cake Cookies sound kind of disgusting, but are (deep breath) the best ever.” I’ll let you know in 3-5 business days. Leaving so much unsaid, but with the intentional delicacy of a head nod, I can tell she’s serious about this one. In few to no words Julia sells me on the Chocolate Babka – voted 2013’s best by NY Magazine. With no reasoning other than Julia’s short, quick inhales and exhales – almost lyrical – I get the picture: the babka and the regulah do not disappoint. From what I can tell, Breads baked goods may outsmart Julia’s 13-hour clean eating streak in hour 14. Indubitably, with reason. My heart flickers with desire at the sound of it. In nothing less than poetry, we share butter-cake-sentiments of gasps and indistinguishable words that parallel the affection of Shakespeare’s Sonnet 18. Soho House, West Hollywood – Brown Butter, Chocolate Chip Cookies. Dare I tell you, the exact cookie, intoxicating sea salt chunks and all, can be found at Soho House on 9th, Ludlow House on Ludlow, and Cecconis in South Beach (for all those investing in a post-NYE pig out – myself included). Sweet Lady Jane – Triple Berry Shortcake. Again, a butter cake for the books, dancing the fragile line that separates dessert and art. Susie Cakes – 7-Layer Bars. Never less than coy with her explanations: Julia pats her heart mimic of those first-love, first-crush, Taylor Swift-y feelings. A graham crackered, chocolate chipped, coconut, pecaned combo – who could find the words? As we weave our way through tables of sticky fingers and licked lips toward the exit – Julia off to try The Original Soup Man ala Seinfeld – I look back at our crumb-free table, void of dirty napkins and chocolate-smeared forks, quickly being taken up by a family of four besotted in plates of buttercream. You’ve never seen greater willpower.